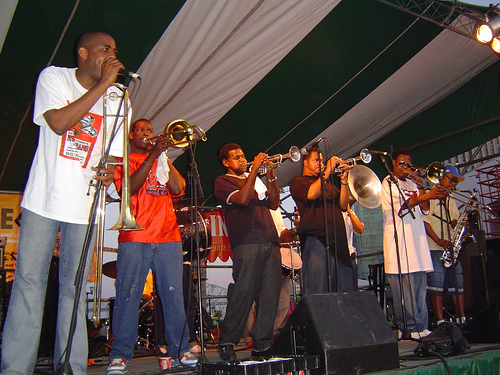 The Lil’ Rascals Brass Band began playing in the late 1990s, led by trombonist Corey Henry. After playing around New Orleans for several years, the band released We Shall Walk Through the Streets of the City in 1998 (Got Fire Music). The album included traditional tunes like “Paul Barbarin’s Second Line,” “Panama Rag,” “Ain’t Misbehavin’” and several spiritual tunes like “What a Friend We Have in Jesus.” The band’s emphasis on traditional tunes was somewhat unusual for a modern brass band, although faster tempos hinted at the band’s direction. After Streets of the City established Lil’ Rascals’ ability to play traditional brass band repertoire, their 2001 album Buck It Like A Horse added a host of progressive songs to the tradition. “Knock with Me – Rock with Me” showcased Glen David Andrews’ vocals about competition among the city’s brass bands, the prevalence of music and dance, neighborhood allegiances, and the issues affecting many of those neighborhoods, including violence and drug use. Rebirth tried to get me! Rascals roll with me! Tenth Ward tried to get me! Sixth Ward roll with me! Who that shot D-Boy? Gotta get him, gotta get him! Buck It Like A Horse also featured “Rascals Got Fire,” an original by bandleader and trombonist Corey Henry that has since been adopted by virtually every brass bands in the city (“Rebirth Got Fire,” “Hot 8 Got Fire,” etc.). Members of the Lil’ Rascals included Corey Henry and Gregory Veals (trombones), William Smith, Dewon Scott, and Chad Honore (trumpets), Vincent Broussard and Ben Ellman (saxophones), Terrence Andrews (bass drum), Eldridge Andrews (snare drum), Jeffrey Hills (tuba), and Glen David Andrews (trombone). The Lil’ Rascals disbanded in the early 2000s. After Hurricane Katrina, Corey Henry played with the Rebirth Brass Band and then joined Galactic in 2010. Interested in band for baby shower of august 23, 2015. Inquiring about pricing details.